STARLOGGED - GEEK MEDIA AGAIN: 1979: MARVEL UK REVEALS "THE MARVEL REVOLUTION: PHASE 1"
1979: MARVEL UK REVEALS "THE MARVEL REVOLUTION: PHASE 1"
Although he didn't stick around for long (leaving, "by mutual consent", the next year), Dez Skinn certainly made an impact on the moribund MARVEL UK line. Elements of his overhaul of the line (the cheaper printing process, the refined line-up of strips) remained for several years. The much ballyhooed HULK COMIC, complete with UK originated strips, may not have been a lasting success (the UK strips were largely dropped, on cost grounds, after the first twenty-odd issues and it was cancelled within fifteen months) but DOCTOR WHO WEEKLY, of course, continues today as DOCTOR WHO MAGAZINE. STARBURST accompanied its creator to Marvel and remained until it was sold several years later. Recruited in '78, Skinn began is overhaul in January 1979. 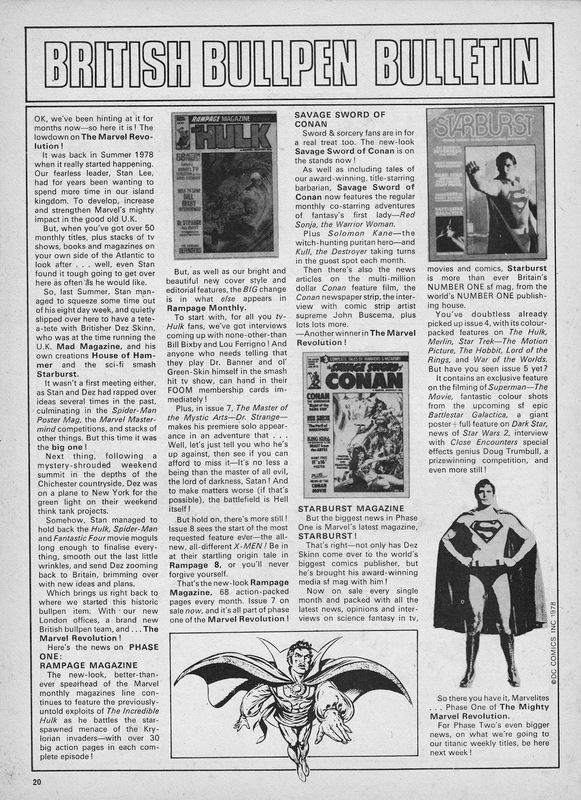 This is his first BRITISH BULLPEN BULLETIN, published in the weeklies dated 10 January 1979, outlining Phase One of his "Marvel Revolution": a revamp of Marvel's monthlies.